The S&P made it's all time high September 21, 2018, forming a Fireball Top. rallied, leading many to believe the bull market is back. I do not think so. to approximate the price moves. So time is more accurate than price. 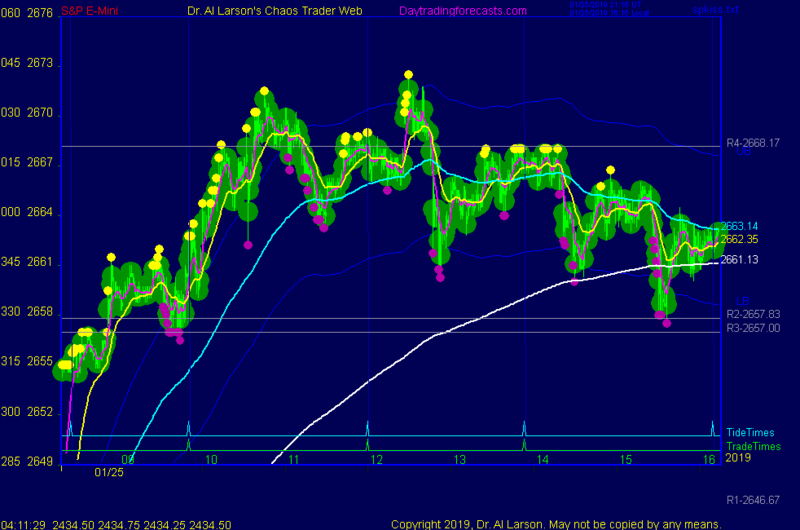 The ZD36 forecast shows the Santa Claus rally topping out near February 21st. The ZD36 as plotted suggest a price high near 2850. That is probably too high. In simple terms, the ZD forecast is down for 3 months, up for 2 months. suggests a 2 month rally of 420 points, to about 2736. 1/25/2019 1:46:56 PM MT Al****:: I'm done. Everyone have a good weekend. Thanks for coming. Take some courses. 1/25/2019 1:24:43 PM MT RR:: I think market will be done next Monday and into Tuesday AM. 1/25/2019 12:50:45 PM MT RR:: Dr. Al, I am planning to move my portfolio of retirement accounts into cash by 01/31/19. 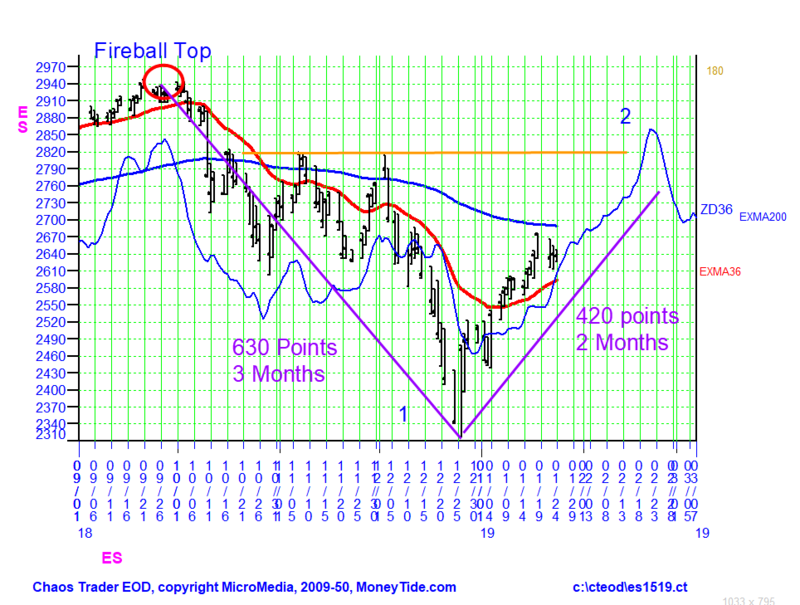 What is your confidence level about the forecast of Fireball Top chart? 1/25/2019 12:25:37 PM MT RR:: For past 3 hours, we lost power here in Orange county, CA. Glad to be back. 1/25/2019 8:56:37 AM MT Al****:: yesterday in the chat room I said the late low looked like the E of an ABCDE correction down from last Friday's high. It was. 1/25/2019 8:09:40 AM MT Al****:: RR, are you on? 1/25/2019 8:08:02 AM MT Al****:: Glad to hear that, GON. 1/25/2019 7:47:27 AM MT gon:: Yes, thank you! I'm enjoying the materials from the Cash In On Chaos sourse, and enjoying the Chaos Clinic every Friday- It feels safer now trading with your experience behind. Looking forward to do another of your courses later this year. 1/25/2019 7:03:21 AM MT jvj****:: Good morning everyone. Al, thanks for updated chart. 1/25/2019 6:58:31 AM MT Al****:: GM all. Good luck today. Chaos Clinic is now posted on the AUX page. 1/25/2019 6:50:43 AM MT RR:: Good morning all. 1/25/2019 6:46:08 AM MT gon:: Hi Al, any coments on the AUX chart?